Has the House Judiciary Committee Majority Lost Its Mind? On the odd chance that you're looking for a case study in how to ignore facts and turn a heartbreaking situation for millions of American families into a juvenile BuzzFeed rip-off, you're in luck. 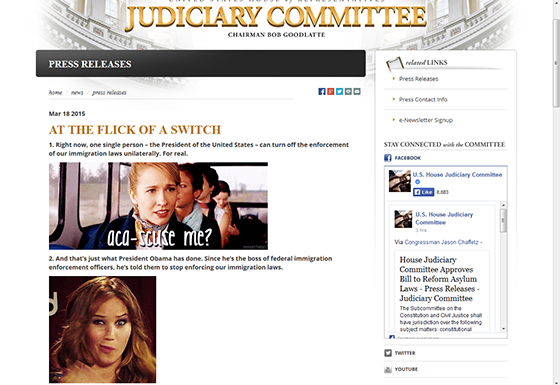 Yesterday, the House Judiciary Committee showed everybody just how out of touch with reality they are by posting this asinine "press release," which relies on tired misrepresentations about the Obama administration's track record on immigration, wrapped in adorable gifs from your favorite teen movies. Sound the alarm, because according to the post, President Obama has stopped enforcing immigration laws. This is, of course, the same president who has spent more on immigration enforcement than any other president in history, and the same president who was prompted to act and bring sanity to the immigration system only after giving Congress ample time to deliver bipartisan comprehensive immigration reform, which passed in the Senate and stalled in -- wait for it -- the House of Representatives. The House Judiciary Committee says we need "innovative solutions" to fix the country's immigration system, and it's prepared to tackle them one at a time. What do those solutions look like? They look like another version of the SAFE Act, a bill that would essentially make racial profiling the law of the land, allowing state and local authorities to pick up, arrest, and detain people who "look illegal." If you think that sounds like a law that would lead to civil rights violations, you'd be right. Just ask Sheriff Joe Arpaio, the poster child for these policies, who was slapped with a court ruling determining that this approach produces widespread patterns of racial profiling and discrimination. The House Judiciary Committee also says that we need to tackle the matter of asylum seekers from other countries, like the pressing issue of children fleeing violence from Central America. Showing unwavering empathy for these victims of violence, their solution is, naturally, to make it more difficult for children who are trying to escape violent countries to seek haven in the United States. They did, however, have time to pass a bill that would allow families being persecuted for homeschooling their children to seek asylum here. Let's hope the countries around the world we chastise for unfair treatment of asylees and refugees weren't watching. These issues may be funny to the House Judiciary Committee, so much so that they wasted part of their day finding their favorite Bring It On gifs to illustrate their amusement. But to Latinos in this country, the committee's combined inability to put forward viable solutions on immigration reform, and its penchant for passing bills that deliberately target our community, is downright offensive. One in six people in this country is Latino. And one in 10 Latinos, including citizens and legal immigrants alike, reports being stopped each year based on suspicion of immigration status. Are we a nation that tolerates laws that will legitimize and expand racial profiling and trample on all Americans' civil liberties? Are we a nation that simply ships scared children straight into the throes of violence? Are we a nation that would rather continue to tear families apart needlessly, when we have a clear path forward in our hands? To the majority leading the show in the House Judiciary Committee, we suggest that if you indeed want to "preserve the rule of law and protect the integrity of our generous immigration system," then maybe it's time to get to work on comprehensive immigration reform rather than cobbling together insulting lists that mock the heartbreak that millions of American families, particularly the Latino community, feel every day thanks to the nation's broken immigration system. This piece was first posted to the NCLR Blog.